A Girl's Guide to Drinking Alone is a blog, where I drink alone at bars, then review them for how awesome or awful they are for women to go to alone. Based in NYC. 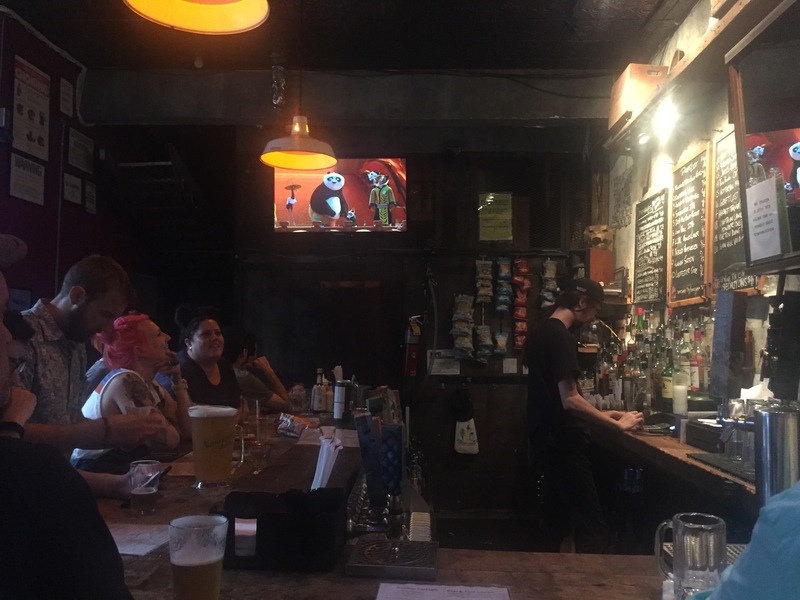 The Place: An old tire shop refurbished into a beer bar because Brooklyn. The Time: Wednesday July 4th, 6:45pm. Happy America day, I guess. Though I’m really not fond of America rn. I’m going to a friend’s rooftop party in a bit, so I stop in for a drink at a bar nearby beforehand. The bar I was planning on going to is closed for the holiday (boo) so I walk two more blocks over to Mission Dolores because there's always another bar in this city. The Vibe: The entrance is through the open courtyard area, unlike most bars where the outdoor seating is in the back. It’s lovely, but also grungy? Am I in Gowanus right now? That’d make sense. Eh, technically it’s Park Slope but it sure feels like Gowanus. Christmas lights are everywhere, exposed brick walls, exposed wooden beams, a skylight that takes up almost the entire ceiling. There’s a pinball machine that they also use for keg storage somehow. The bar itself is in the very back and it’s packed even though there are empty tables. So I hover, attempting to get the bartender’s attention. At the tables, there are some large groups of friends, a few duos, lots of pitchers of beer. There is an actual child playing the pinball machine and I do not know who he belongs to, but they ARE playing Kung Fu Panda on the TV, so...? At the bar there are a handful of guys by themselves, then some small groups of friends. There’s a dude in a stupid little cap, with a messenger bag slung over his shoulder even though he’s sitting (there are hooks under this bar, has he never carried a bag to a bar before?). He’s wearing cargo shorts that would make Tan France cringe. And from the second I walk in, he will not stop staring at me. The only entry I have is between him and another solo guy and when I lean in to tell the bartender my order, I think I feel him sniff me? So yeah, I choose to hang at the stools at the wall nearby. The Bartender: Long-haired, wearing a baseball cap, some tats. When I order my drink, he tells me it will be missing the mint, they’re out of mint, do I care. When I hesitate (because I always differ to the bartender on matters such as this), he shrugs at me and says “it’s just a, y’know” and makes a really hyperbolized gesture for garnish. If we were playing charades, we would win in a landslide. The Drink: If there’s one thing I can still thank America for, it’s bourbon. Truly an American creation - goddess bless ya Kentucky. 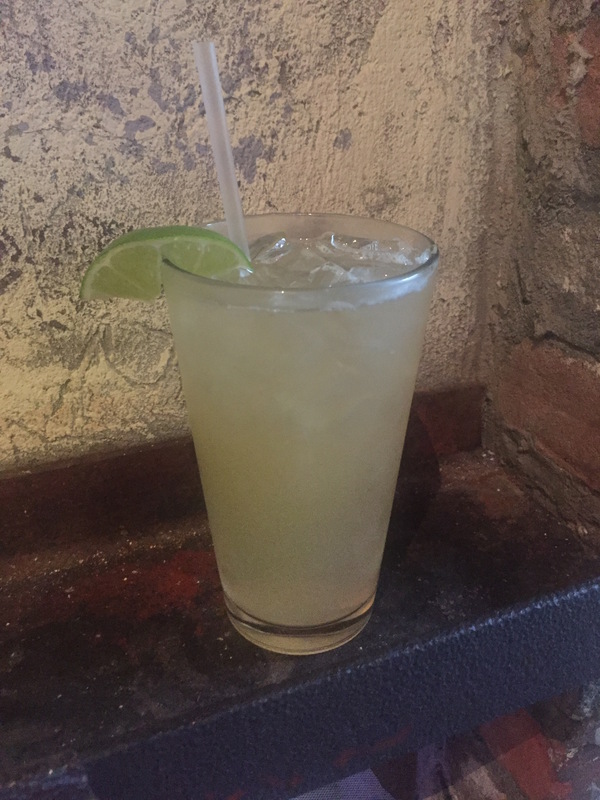 So in the spirit (heh), I order the one bourbon cocktail on the menu: the Upstate Mule. It’s bourbon, lime, ginger and mint. Except no mint. The drink itself is fine. Truly just a Kentucky Mule and I do not know why they’ve bothered to name it anything else. Then I realize that this drink isn’t even made with traditional ginger beer, it’s ginger ale. So effectively it’s a whiskey ginger with some lime that they charge $12 for. Cool. Probably should've gotten a beer. Was I Hit On? I purposely sit away from messenger bag guy because I know if I sit next to him, he’ll talk to me. I also don’t want to take out my notebook or magazine for this same reason so I spend my whole time here buried in my phone. Messenger Bag keeps looking at me the whole time but he never says anything. I guess my tactic works? But sad that I have to take a tactic. In other news, there’s a couple at the other end of the bar who take tequila shots and loudly cheers to America. Then they spend the rest of the time agree-yelling at each other. You know what I mean, “YES OH MY GOD” “ONE HUNDRED THOUSAND PERCENT” “EXACTLY EXACTLY.” Tbh I kind wish I was one of them. Should You Drink Here Alone? Oh comrades. I don’t think so? But I have to say, I came here on Fourth of July, drank a cocktail at a beer bar, and encountered one strange creepy man. So perhaps the move is to come to Mission Dolores on a different night, beer in hand, with pals by your side. *ADDENDUM* I found out later that Mission Dolores is dog friendly! So at least there's that.